ABCDEFG..HIJKLMNOP..QRS..T.U.V..WX Y and Z now I know my A B C next time won’t you sing with me!Lea..
Brave firefighters spray water at the inferno from ladder trucks and the ground as they try to supp.. 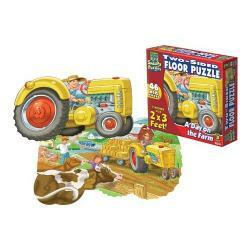 Addition with numbers from 0 to 20Children will see that two different calculations may give the sa..
With Mudpuppy's Around Town Puzzle Play Set, the fun doesn't stop when the puzzle is complete.Use t..
With Mudpuppy's Enchanting Princess Puzzle Play Set, the fun doesn't stop when the puzzle is comp..
Mudpuppy's Robotics Lab Puzzle Sticks includes 24 double-sided puzzle sticks that create six unique.. Beautifully illustrated puzzle with funny dinosaurs!Place the puzzle pieces in the right place one b..
A 25 piece frame tray jigsaw puzzle depicting a Kiwi bird from a photograph taken by Rob Suisted.Pu..
Get ready for reading fun! Match It Words learning puzzle game is a fun, stimulating game designed ..
Includes 26 two-piece self-correcting puzzle sets, Teaches upper and lower case letters, Colourfu.. The natural wooden base showcases the bright two toned colourful letters. Easy to dump out and play.. Complete this 48 piece wooden jigsaw to reveal a scene rich with detail and find out which animals ..
Help your toddler learn about shapes and colours with this block sorter! The chunky pieces are perf..
Ahoy, me hearties! Ready yer sea legs and leave the landlubbers behind. Complete this 48 piece..
For globetrotters, everywhere this sturdy 36 piece wooden puzzle features vibrant, detailed artwork..